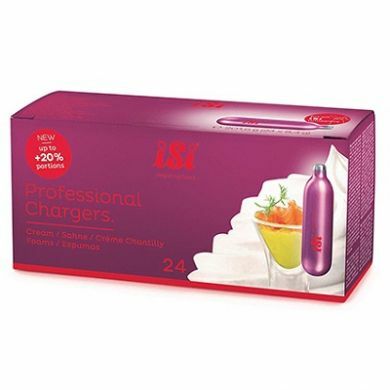 Normal cream charger cartridges have 7.5 grams of nitrous oxide gas inside them - these new ISI Pro chargers have 12% more! Filled with 8.4 grams of N2O the ISI Professional line is 20% more efficient than the original cream chargers, which means you use less cream and fewer chargers. These chargers are compatible with all standard cream whippers, so there is no need to invest in new equipment. Made in Austria by the worlds leading producer of cream whipping equipment, as supplied to Costa etc. Universal screw-in chargers. Not for Kisag. Filled with pure N2O gas in a state of the art factory. Each charger is weighed electronically with filling guarantee. Capsule is made of 100% recyclable stainless steel. Guaranteed no oil residues; production is certified according to HACCP.